Independent Hip Hop lifestyle blog based on the West Coast. 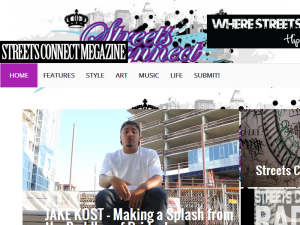 Streets Connect focuses on independent and underground artists, with a dedication to preserving Hip Hop culture as a creative community. New Hip Hop music videos, songs, news, events, mixtapes and more mixed with original interviews, features and coverage of the unique voices making up the Hip Hop community. The site also shines a spotlight on the latest in street art and graffiti, as well as, sneaker head culture and style. This what your Streets Connect Blog Ad will look like to visitors! Of course you will want to use keywords and ad targeting to get the most out of your ad campaign! So purchase an ad space today before there all gone! If you are the owner of Streets Connect, or someone who enjoys this blog why not upgrade it to a Featured Listing or Permanent Listing?